I've commended the Criminal series for continuing to innovate and expand the shared universe of Center City with compelling standalone stories, with the three "one-shots" in The Dead and the Dying standing out as ostensibly the high point of the series. The back cover of Criminal Vol. 5: The Sinners recalls one of my favorite lines from Grant Morrison's The Invisibles -- "And so we return and begin again" -- when it lets us know that "CRIMINAL's most popular character, TRACY LAWLESS returns in THE SINNERS." In an era of reboots and remakes, a deviation from the highly original work being done by Criminal ought to give any comics fan pause. Fear not, loyal readers. Even though this collection revisits a familiar face, The Sinners is as enjoyable as the other trades in the series, and you'll barely even notice that this is "another" Tracy Lawless story. A year into his tenure with Sebastian Hyde, former soldier Tracy Lawless is on his way to becoming "the worst hitman in the world." It's not because he's sleeping with Hyde's wife; rather, Tracy is spending time investigating his targets, making sure they "deserved it." Tracy's losing face with Hyde, who's losing face with his enemies, so the two work out a mutually beneficial arrangement: if Tracy can solve the murders of Hyde's apparently "untouchable" associates, Tracy is free to go. Of course, as with any Criminal volume, the plot thickens: the killers have a surprisingly good (and moral) reason for their actions, and Hyde fails to notice his wife's infidelity because he thinks his daughter Sabrina is sleeping with Tracy. All the while, Tracy is being pursued by a military official looking for a certain deserter in Center City, forcing him to choose between two unpleasant futures: the ever-suspicious shadow of Hyde, or the threat of death in an army that doesn't even want him. 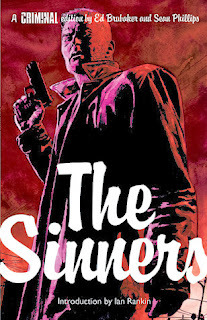 The Sinners is the first Criminal miniseries, after the creators decided to release separate volumes for each story arc rather than rely on consistent sequential numbering. It's a smart shift, since this is a self-contained story even beyond the recurrence of Tracy Lawless. In fact, the story is so accessible that the reuse of Tracy Lawless almost feels superfluous; I don't want to say it's just a sales tactic, but there's no reason this couldn't have been a brand new character, since Tracy is a different man after a year with Hyde. For one, he's more reticent, a perfect mirror of his father, whose own internal conflict rendered him inscrutable to others in the same way that no one in the story really knows what to make of Tracy. And you'd think that after four volumes of this stuff, I'd be able to telegraph some of the fabulous twists and surprises coming withing The Sinners. But no, Brubaker and Phillips have all kinds of wonderful toys at their disposal. There's more going on in these five issues than in a lot of twelve-issue maxiseries. The murder mystery, the question of Mrs. Hyde's fidelity, the looming war with the Triad, and the pursuit of Army Agent Yocum could all have been their own A-, B-, or C- plots in a longer Levitz Paradigm-esque epic. But The Sinners throws all these plots into one noir stew and, miraculously, never shortchanges any of them. Instead, when they all bump into each other, the result is some of the smartest character writing in comics. Brubaker has every one of these voices nailed: gruff Tracy, carefree Sabrina, sinister Hyde, and company-man Yocum. With Phillips still on art (thank heavens for consistency! ), the story is full of fantastic turning points that can only be described as "out of the fire, into the frying pan." In such moments, the story harmonizes delightfully with the art to give a true sense of the magic of comics. When we meet Yocum on a bus into town, the way Phillips renders his features meshes perfectly with his military determination to track down Tracy. Bad to worse. When Tracy stares down the barrel of a Triad gun, we know this situation can only deteriorate, and the bloody shootout that ensues -- aided by the cleverly deployed noir trope of begrudging allies -- doesn't do anything to ameliorate the central problems of the book. The moment I'll remember forever from this book, though, has nothing to do with the murder mystery or the moral complexities therein. I probably won't remember Mrs. Hyde long after I've finished the series, nor will be haunted by Yocum's quest. No, it's a quiet moment, one that subverts our expectations and does such a wonderful job putting us in every character's head that the scene works even before Brubaker tells us what's happening. After Tracy rescues Sabrina from a dangerous boyfriend, the car ride home is many things -- awkward, earnest, funny (both uncomfortably and otherwise). It tells us what motivates wild child Sabrina, and we get a wonderful insight into what kind of man Tracy really is; as much as he doesn't like his current lifestyle, seeing Sabrina imperiled triggers his instinctual morality. But it's a moment that goes horribly awry when Sebastian Hyde, impaired by a limited perspective, misunderstands the significance of seeing Tracy drive Sabrina home. The artwork over Hyde's shoulder through his bedroom window as he looks down on Tracy and Sabrina tells us exactly how he's going to react, even before he mumbles, "What the f---...?" It's played perfectly, and the scene would have worked without dialogue because of how well Brubaker establishes the players' motivations and because of how deftly Phillips uses Hyde's body language. I've described the Criminal series as cinematic, but I think that does a certain injustice to the books, especially The Sinners. While I always meant it as a compliment, a way of saying how smoothly Brubaker and Phillips can tell a story that's as impossible to leave as an engaging feature film, it's moments like Hyde's false epiphany that remind me how integral the comics form is to this series. The scene with Hyde works because we as readers can look away from the panel as the dread creeps in, rejoining the story only once we've realized that the inevitable might be much worse than what we imagine. But remember, this is a series where nothing is inevitable. I can safely say that I didn't predict a single conclusion to any of Criminal Vol. 5: The Sinners's myriad plotlines, instead only catching glances at the future once these master craftsmen were ready to tell me where it was all headed. And though the book ends on a somewhat dour note, the larger story -- that of Center City and the moral clashes caused by colliding ethical frameworks -- is going to continue in the next volume as Brubaker and Phillips continue weaving this ornate tapestry. But The Sinners is only open-ended in that sense; what readers get is a full story, beginning to end, beautifully told and expertly managed, requiring no absolution for any perceived sins.